As a pioneer in innovative human capital management strategies, our talent assessment, training and development solutions optimize your employees' skills and qualifications, increase your team's productivity and organizational commitment, and build a healthier working environment while strengthening your brand's reputation. INSPIRE™ is an organizational development platform which incorporates recent advancements in psychological dynamic assessment technology with innovative talent development solutions to help your team achieve their full potential. 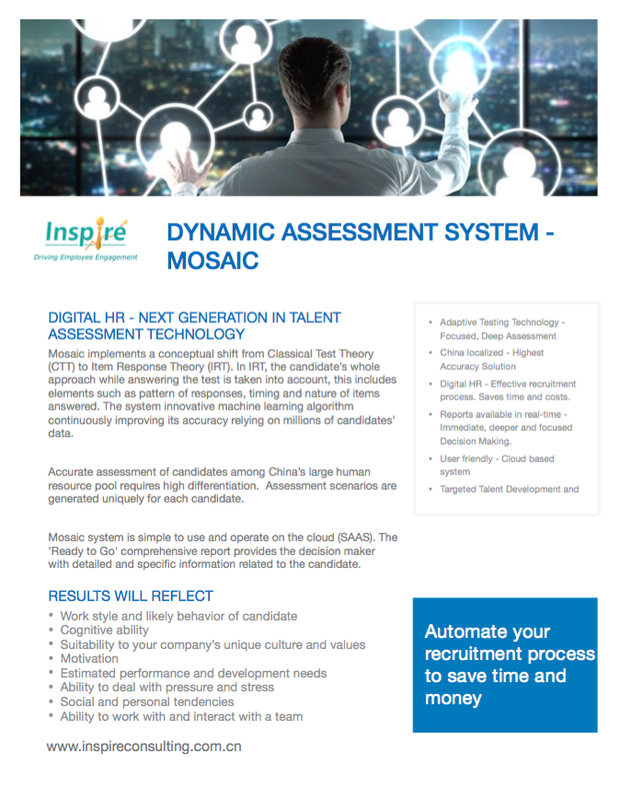 While our automated talent assessment systems allow your HR personnel to save time and money on candidate screening, the INSPIRE™ training programs motivate your employees to achieve their organizational objectives, help them develop the skills and behaviors necessary to grow within your company, and facilitate positive, long lasting lifestyle changes. The INSPIRE™ program is a smart, cost-effective solution which helps your employees develop the skills and mindset necessary to successfully achieve your company’s objectives. Our foremost goal is to reduce the gap between employee compensation and quality of job delivery, and transform your business to ensure sustainable, long-term growth. One of the biggest challenges for modern organizations is ensuring their business success while under constant pressure to cut costs while boosting efficiency and the bottom line. While qualified and productive employees are a key asset for every thriving organization, between 68% and 94% of employees do not belong in this category. Moreover, there is a rising gap between employee costs and their capabilities, and many employers do not get the performance they pay for. — Elaine Zhang - Head of HR, Covo Inc. The Inspire program gives your employees the mental tools and applicable skills to increase their performance in the workplace. To give your organization a competitive edge, we developed the most comprehensive employee development program. The INSPIRE program embodies the best qualities of productivity and soft skill training with the inspirational role of a motivational speaker. The result is an increase in employee work productivity and job satisfaction. An accelerated learning experience that transforms novice and high-potential managers into powerful leaders. 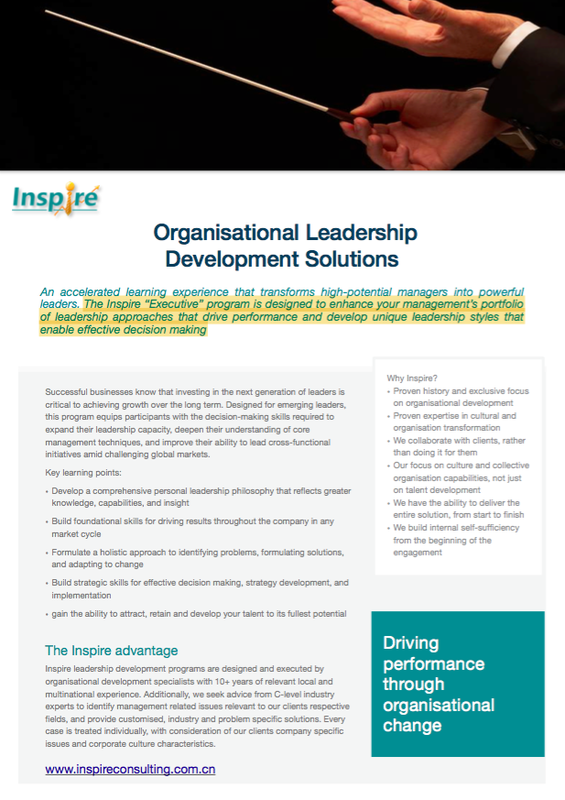 The INSPIRE leadership development program is designed to enhance your management’s portfolio of leadership approaches that drive performance and develop unique leadership styles that enable effective decision making. INSPIRE leadership development programs are designed and executed by organizational development specialists with 10+ years of relevant local and multinational experience. Additionally, we seek advice from C-level industry experts to identify management related issues relevant to our customers' respective fields, and provide customized, industry and problem specific solutions. Every case is treated individually, with consideration of our costumers' company specific issues and corporate culture characteristics. Mosaic implements a conceptual shift from Classical Test Theory (CTT) to Item Response Theory (IRT). In IRT, the candidate’s whole approach while answering the test is taken into account, this includes elements such as pattern of responses, timing and nature of items answered. The system innovative machine learning algorithm continuously improving its accuracy relying on millions of candidates' data. Accurate assessment of candidates among China’s large human resource pool requires high differentiation. Assessment scenarios are generated uniquely for each candidate. Mosaic system is simple to use and operate on the cloud (SAAS). The 'Ready to Go' comprehensive report provides the decision maker with detailed and specific information related to the candidate.